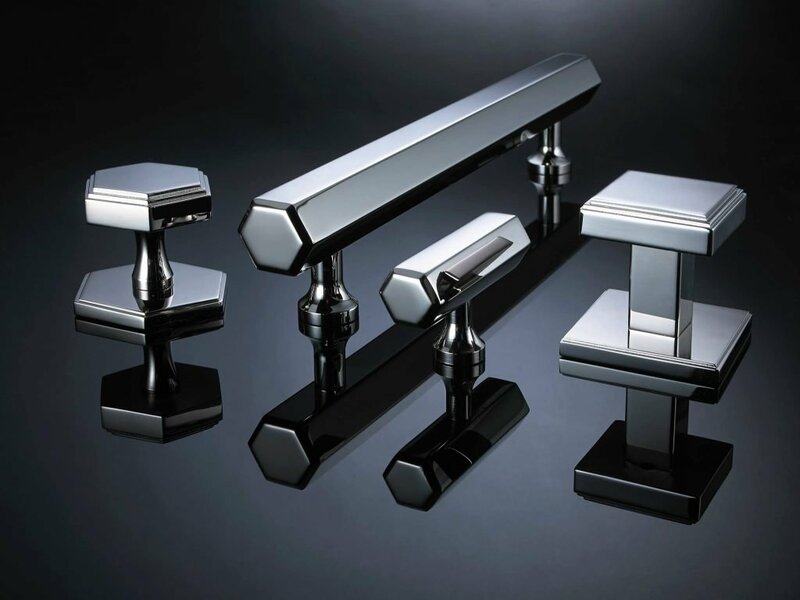 Colonial Bronze is celebrating over 90 years of manufacturing high-end cabinet and architectural hardware in Torrington, Connecticut. 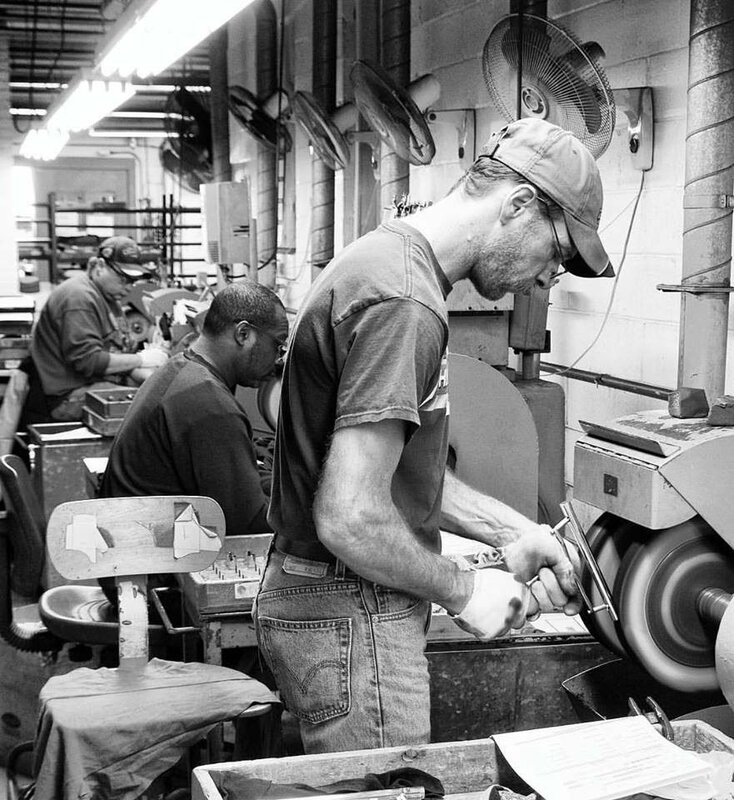 Since 1927, our hardware has been produced in-house, from start to finish, by American craftsmen and women. Although our facility and product catalog have drastically expanded over time, we’re still committed to our roots of providing the finest quality products, in the most eco-friendly way possible. For over twenty years, we have offered our “Finishes for Life” guarantee; and for over a decade, we have been SCS certified for using over 94% Pre-Consumer Recycled Content in all of our products. Currently, we offer an endless array of solid brass knobs, cabinet handles, appliance pulls, bathroom accessories, and much more. Our products vary from Traditional to Transitional to Ultra-Contemporary. We offer an industry leading variety of finishes and more options for customization than any other brass hardware manufacturer. If you can’t find it at “The Bronze,” you won’t find it anywhere. As a third-generation family owned and operated small business, we take pride in quality and tradition. For over 90 years, every single order placed with Colonial Bronze has been hand-crafted, piece by piece, at our only factory location in the Northwest Hills of Connecticut. Every product begins here in the form of raw brass before it is cut, prepped and hand-finished by one of our experienced American artisans. At one point, over 75 percent of the United States’ brass was produced here in “Brass-Valley.” Now, we’re one of the last remaining entirely American-made manufacturers in our industry. We don’t send any of our products out to be finished, therefore we’re able to offer an attention to detail, variety, and capability for customization that is second-to-none in our industry. When you choose “The Bronze,” you’re not only supporting American small business and local craftsmen and women, but you’re choosing an eco-friendly product you can be proud to display. We don’t just claim to be “Green;” we continue to prove it year after year. We’re now one of the last remaining Recycled Content Certified manufacturers in the decorative cabinet hardware industry (registration # SCS-MC-01709) by the Scientific Certification Systems (SCS). We have held this certification since 2006. This renewed documentation verifies our use of a minimum 94 % Pre-Consumer Recycled material on every piece produced at our factory. 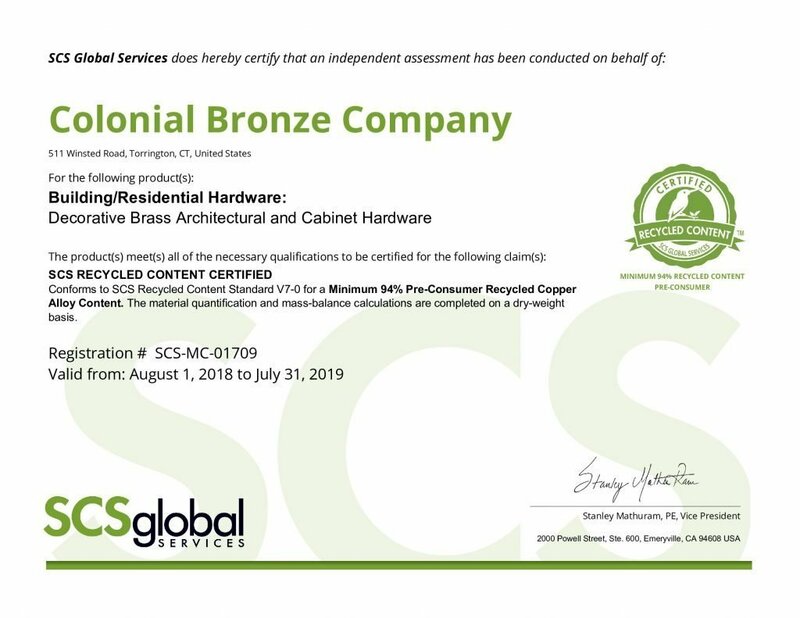 Our certification from SCS also means that the use of Colonial Bronze products in your residential or commercial project can earn points towards your Leadership in Energy and Environmental Design (LEED) certification. Colonial Bronze offers an industry leading variety of finishes, and more than forty of those hand-finished options come with a “Finishes for Life” guarantee. Our “Finishes for Life” warranty, guarantees all of our lacquered products will be free of natural tarnishing, discoloration and pitting, (subject to normal wear and tear) for the lifetime of the product. We warrant to the original purchaser, any lacquered product that discolors over time, will be repaired or replaced (at our discretion) for no additional cost. As every product in our line is produced, in-house, from raw material to finished product, our capability to customize your hardware is UNPARALLELED. 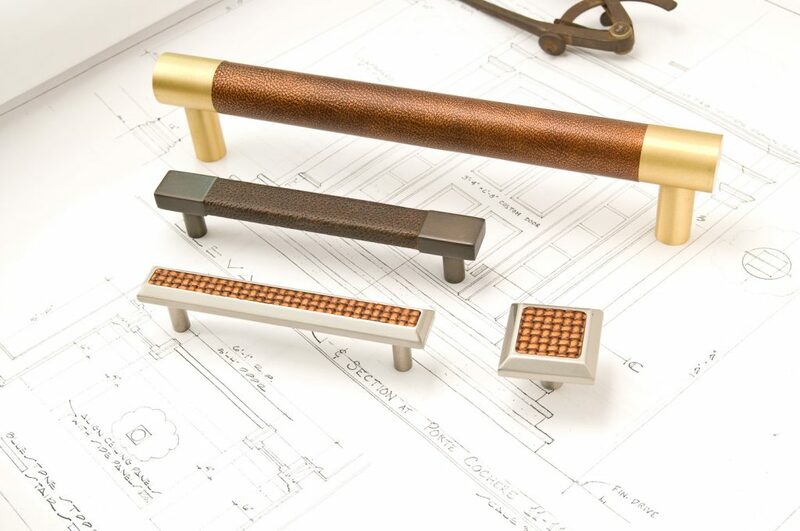 Colonial Bronze has been the go to source for custom crafted hardware in the industry for decades. We offer the ability to customize the center to center, overall lengths, and projection on the majority of our popular products. We can customize most of our cabinet handles, appliance pulls, and towel bars to meet your specifications within 1/16th of an inch. We can even produce a custom or antimicrobial finish! WATCH HOW IT'S MADE IN TORRINGTON, CT, SINCE 1927! For over 90 years, Colonial Bronze has produced the finest cabinet and architectural hardware available. Unlike our competitors, we DON’T import finished hardware from over seas – we never allow anyone else to be responsible for the quality that bears the Colonial Bronze name. We control every aspect of our production and the level of quality that goes into our products, from start to finish. When you order hardware from Colonial Bronze, American craftsmen and women will do their best to deliver the finest quality product possible.